One of the best bread-and-butter sound modules - hardware or software - that money can buy, SampleTank 3 is big and beautiful, if not particularly bold. Slick, ergonomic new interface. Vastly extended sample set. Excellent effects. Crossgrade pricing for IK users. 64-bit only. Few Multi presets in library. It might seem hard to believe, but the third version of IK Multimedia's sample-based virtual sound module, SampleTank (VST/AU/AAX/standalone), has been ten long years in the making. Now based on 33GB of sample content, 25GB of which is new, it greatly improves on the previous version while maintaining compatibility with old patches (you can import all your 'Powered by SampleTank' libraries). 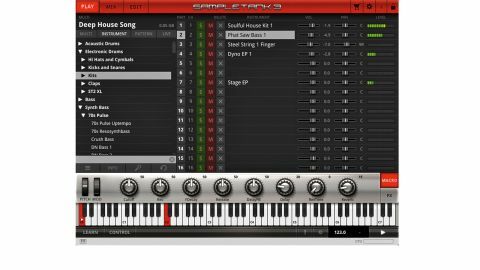 Just like its predecessor, at the fundamental level, SampleTank 3 works like a traditional multitimbral synth/sampler, with Instruments loaded into each of its 16 independently triggered Parts. However, beyond that, it's a whole new ball game, with a brand new engine and a redesigned interface. "The sheer volume of effects is impressive, with 55 excellent processors extracted from IK's T-RackS and AmpliTube suites"
The action is now spread across three main windows (Play, Mix and Edit), each containing further sub-pages as required. Sets of Parts are combined in Multis (import of old SampleTank Combis is supported), each including four auxiliary effects sends (via the Mix page), and groups of which can be controlled via the new Live mode (see Live Sets). There are five insert effects slots per Instrument, as well as on each Auxiliary return and the Master output. The Instruments themselves come in three types: 'standard', 'articulations' and 'looped'. Articulation Instruments are multi-articulation patches employing one of three switching modes - key, velocity or mod wheel - while loop Instruments are audio loops that sync to the global tempo. The vast majority of Instruments are standard multisampled patches, however. Each Multi Part can also include up to 128 MIDI patterns, assigned to individual notes/keys for triggering. Patterns get their own tab in the Play page browser, where they're categorised much like the Instruments. You can adjust the velocity Intensity and Quantise settings of loaded patterns, and drag them into your DAW arrangement as MIDI clips. "ROMpler-generated guitars often sound weak, but here the electric patches are remarkably convincing"
In terms of numbers, what all of this amounts to is over 4000 Instruments in 21 categories, more than 2500 audio Loops and over 2000 categorised MIDI files. The sheer volume of effects is similarly impressive, with 55 excellent processors extracted from IK's T-RackS and AmpliTube suites, including six amp simulations, 14 modulation processors and a range of classic emulations such as the Vintage EQ-1A EQ and Black 76 compressor. With all that in mind, we're quite surprised that ST 3 doesn't go the whole hog and tie in to IK's Custom Shop. SampleTank 3's workflow transcends that of its predecessor, which was cluttered and fiddly to use. High points include ready access to the currently selected effects plugin from all pages via the FX button, and quick preset editing in the Macro control panel at the bottom of the GUI. We also really like the new instrument Edit page, with easy Part selection buttons always to hand on the right-hand side. So, how are the sounds? Well, the keyboard instruments are particularly great, offering an abundance of acoustic pianos, electric pianos and organs. Tuned percussion instruments like marimba and vibraphone sound rich and wide, and the orchestral strings, brass and woodwind come from IK's superb Miroslav Philharmonik package, with plenty of articulations and both ensemble and solo patches. There are also some edgy new pop brass and woodwind patches. Acoustic drums are very well covered, with a handful of core kits serving as the basis for numerous presets, and individual component menus (kicks, snares, cymbals, etc), providing plenty of flexibility. There's also a collection of electronic drums, with patches labelled by style (Dance, Glitch, Dubstep, Trap, etc). ROMpler-generated guitars often sound weak, but here the electric patches are remarkably convincing, including Stratocaster, Les Paul and hollow body instruments. The basses comprise Fender Precision and Jazz, Music Man and Rickenbacker, with picked, finger and slap playing styles covered. "SampleTank 3 has a lot going for it, succeeding in doing what some of the best hardware workstations do"
The synth sounds are grouped by type (Lead, Pad, Bass and FX), and we were most impressed by the variety of the Pad and Bass categories. Naturally, the programming flexibility on offer is nothing like that of an actual synthesiser, but the Edit page's filters and envelopes allow for a reasonable level of tweaking. Rounding things off are some decent 'ethnic' sounds (bouzouki, dulcimer, gamelan and suchlike). As well as its instruments, SampleTank 3's loop library is surprisingly good, covering current electronic styles (hip-hop, EDM, dubstep and house) plus Latin and Cuban styles, and drum kit loops. Obviously, they're not a replacement for an ongoing collection of bespoke sample packs, but they do deliver quick, convincing results, and the Stretch (SampleTank REsynthesis TeCHnology) engine, with its individual control of Pitch, Time and Harmonic Shift, is great for manipulating them in real time. Our biggest criticism of SampleTank 3 is that, although there are loads of Instrument presets onboard, there are very few 'combi' presets, layering those sounds into larger-than-life patches. Also, while you can audition MIDI Patterns before loading them, you can't preview Instrument patches (via, say, a pre-rendered audio 'demo', like in Ableton Live 9) nor is there a way to audition a patch for play without overwriting and thus losing the current one. And finally, you can't load Instruments into Live songs without first putting them in a Multi. That aside, SampleTank 3 has a lot going for it, succeeding in doing what some of the best hardware workstations do: enhancing a solid set of samples with just the right effects, thereby delivering ready-made patches that genuinely inspire. If you approach and use it as a high-quality sound module packed with well-produced but very much 'workhorse' sounds, rather than an ultra-flexible sample-based synth, you won't be disappointed.